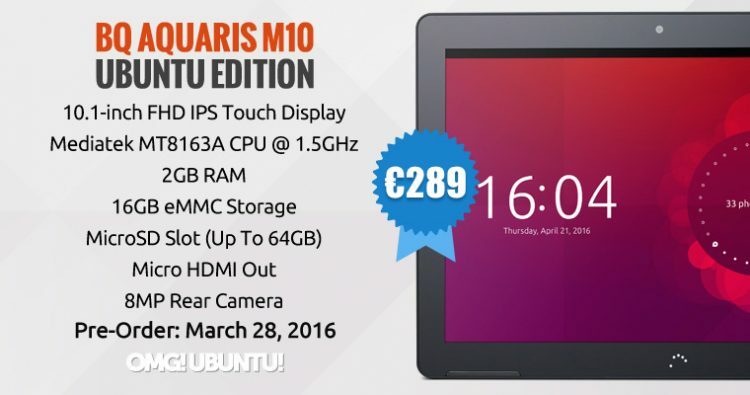 Bq is a Spanish hardware company and they are now taking pre-orders for the brand new Ubuntu M10 tablet. The tablet is one of a kind as was noted in Bq’s description of the tablet that it is the first tablet to run Ubuntu Touch AND also “the first tablet to offer PC convergence”. 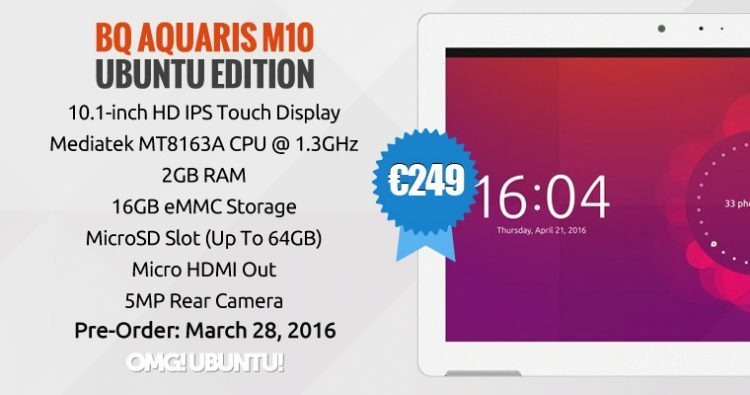 The M10 Ubuntu Edition tablet will be shipped to the European Union and a few countries outside it (including the U.S). From the full list of delivery locations on their website, Bq has planned their deliveries to begin in the second week of April, meaning that if things go according to plan customers will have their tablets just around the time Ubuntu 16.04 LTS will be released. There are two available versions of the M10 tablet on their website and below are the specs. The more expensive of the two models comes in black with a 10.1” FHD (1920×1200) screen, an 8MP rear camera and a 1.5GHz quad-core ARM processor, while for €40, the cheaper model comes in white with a 10.1″ HD (1280×800) screen, a 5MP rear camera and a 1.3GHz quad-core ARM processor instead. The price difference between both Ubuntu models is quite minimal with the cheaper costing between €249 & €259 (the M10 (HD) Ubuntu Edition) and the other costing between €289 & €299 (the M10 (FHD) Ubuntu Edition). Compared to the Android-powered versions of the M10 tablet the prices are a lot less minimal with the M10 (HD) Android version costing €229 and the M10 (FHD) Android version costing €259 (excluding shipping and importation costs if any apply of course). The Ubuntu version of Bq’s M10 has a unique feature that you might be willing to pay a premium price for as compared to the Android-powered version and that is its convergence feature. Being able to function as a tablet in its normal state and an Ubuntu desktop when connected to a Bluetooth keyboard and mouse is definitely a plus. Bq has also made available a free M10 duo case worth €24.90 and a screen protector worth €9.90 with all pre-orders for a limited time. Installing your favorite legacy apps at the moment isn’t available at the moment, however, you can do that with the terminal. We are sure the feature will come to us within the next couple of months. Besides, the tablet comes with a handful of pre-installed legacy apps including LibreOffice, Mozilla Firefox and GIMP.